I was the other guy that paused his dvr. Who ever paid for that advert didn't get there money's worth. I did the same thing and found only this page. I wonder if we will be Junior Detectives or something because we were at least curious enough to check it out (can't qualify as Senior Detectives, seeing as how we haven't solved the riddle, yet). Ok, the show is on again, I too searched for the CSX and ran across this page only in google. I dont have a DVR but i am curious, did they display both 4860 and 4360? So the difference between the csx4860 and csx4360 is that in the first episode I couldn't quite tell the difference between the 4860 and 4360, in fact looking at the stats on the site, I see that a lot of people are still searching for both, so I'm still not 100% decided on which it is, although on week 2 I thought it was csx4860 because that seemed to be the most searched term... Anyway, glad to see that there are a lot of "Who wants to be a Superhero" fans out there, even some without DVRs--Pretty impressive Zach (okay, I guess you could have pushed pause on a VCR, but if you didn't, well then, I'm impressed). Yeah, no VCR, they show the billboard a couple of times during the same segment so if you are watching for it it's not so tough. No DVR I'm waiting on the OCUR card's from ATI and Windows Vista to support the cable card before buying a MCE dvr (MCE rocks, I am running Vista Ultimate at the house but no tv tuner card). Anyway there are no updates here I was hoping someone would have posted the answer. It is interesting that yours is still the only site that pops up when people search for either csx4860 or csx4360. I really don't think that there IS an answer Zach. I think that it is just a random sequence of letters and numbers that someone created without FULLY understanding that there are (more than I imagined) a few of us DVR-type people that google whatever we see on the TV. --and me, if I google it and don't find anything, then I just blog about how weird it is that no one else has created a webpage about it. He he - I'm the real DVR guy. Good Job ! - you nailed it with the pause button! (me=pause button) And yes , some advertising agency deffinitly f'ed up by not using their model number for the tv there ! I love that people are still watching these episodes. It's funny, because still, there are really no sites that list these model numbers... Oh well. Thanks for posting! Incredible!! Sept 07 and still just this site... Figured SOMETHING would come up... Well, it was interesting reading from all the other searchers of... uh... truth? Meaningless info? Not sure. EXCELSIOR! Welchkin Wire A blog of one of my cousins, "A place for the Welch family to love, laugh and learn with each other" Check it out. Courtesy and Capitalization : Green Gabbro A friend of mine directed me to this page, particularly a quote from a comment left by a user: "One more thing, about the iPod. It’s[sic] spelling is part of the branding of the device; capitalizing that second letter helps set it apart (doesn’t it look strange and wrong when people write Ipod or I-Pod)? For a person to do the same thing and try to communicate an image via the spelling of their name just comes across as distasteful. But I’m willing to admit that I could be wrong" --Well, I personally do NOT think it distasteful, but then having a name like D. SKye Hodges, may make me a little biased. The most relevant reason for the capitalization is because I think that the name SKye has a masculine, and a feminine spelling (sorry to all you guys that have the name: Skye, and spell it Skye), I think that the feminine is Skye, and the masculine is SKye (that capital K just gives it that shot of testosterone that makes it a man). Anyway, it is an interesting read on capitalization. --Says D. SKye Hodges --Originator of the SKye. I haven't ever blogged the full story. I changed my name (un-officially) in 1993, the capitalization became mine first because apparently, I'm a lazy typist (I use the "wrong" shift, and I don't let go fast enough when I am typing my name), and secondly because when I first started typing my name as SKye, I realized that it really was better, it just looked more like a male name (I have a somewhat distant cousin named Skye--and she is a girl, so I thought that SKye is just more fitting for me personally). My birth name was Dustin Skye Hodges, and I legally changed it to D. SKye Hodges back in 1999 or 2000. I'm a little different (as a person), and so is my name. But when people get to know me they understand (that me and my name go together pretty well). 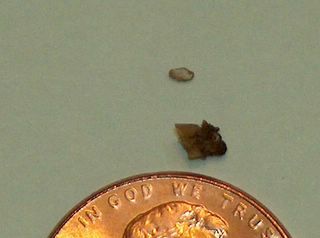 These are two kidney stones that I passed in the last week. The second one (the bigger 4mm one) was passed on July 16th, 2006. This was the most painful kidney stone (of the 5 that I have had, the smaller one being number 4, and the larger one being number 5). I do not wish this sort of pain on anyone and I would HOPE that it is the last kidney stone I will ever have, it won't be, but I sure wish it would. Anyway, sorry to all of you that are grossed out by the pic. It's just a stone--GET OVER IT :) I will be. Drink lots of water. 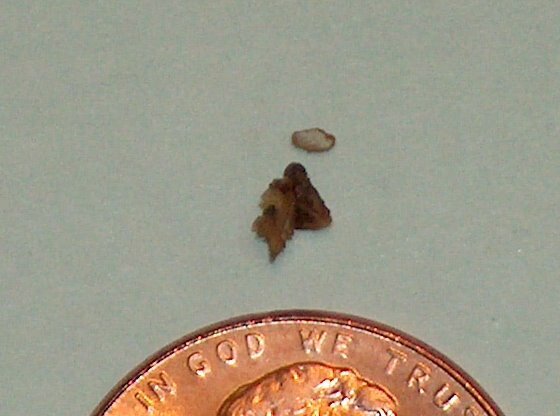 I had a kidney stone in high school and it was horrible pain. The nurses at the hospital told me it's more painful than childbirth, and seeing I'll never give birth, I take their word for it. The nurse also told me to drink lots of water to prevent stones. Haven't had one since... knock on wood.